Alexander P. Ashbourne was an early inventor. He was born into slavery in Philadelphia around 1820. There are very few documented facts about his personal life. He grew up cutting wheat alongside his family members. In his youth, Ashbourne began to think of more efficient ways to cut wheat mainly to make harvesting easier for himself and other enslaved people. He approached his owners with these ideas but they refused to adopt them. Since Ashbourne was born after the Pennsylvania Gradual Abolition Act was passed in 1780, he was not subject to a lifetime of enslavement. Although the exact date of his emancipation is unknown, by 1847 all enslaved people in Pennsylvania had been freed. Ashbourne disappeared from the public record until 1863, when he reemerged working as a caterer. By this time, he was well known and respected in the city. He catered weddings and buffets of the wealthy elite in Philadelphia, and was selected as one of a handful of local caterers for the 1863 Emancipation Celebration held in the city. While attending this event, Ashbourne noticed that the biscuits were simply hand patted and lacked any real form. He began a decade long process to create a device, a spring-loaded biscuit cutter that would guarantee a uniform shape and size. 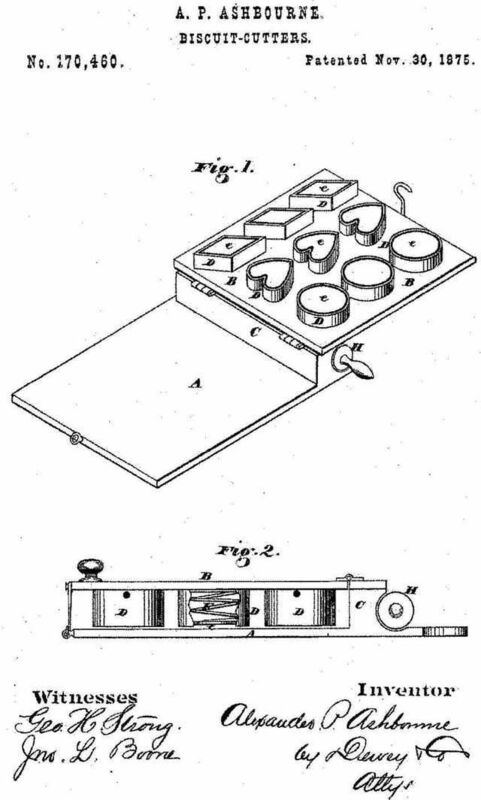 Ashbourne applied for a patent for his invention on May 11, 1875, and on November 20, 1876 he was granted patent number 160,450. His patented cutter had a board to load and unload biscuits easily. There were also metal plates with various shapes. The cook could push down on the plate to cut the dough into specialized shapes. Ashbourne continued to invent, and received a patent for processing coconut oil on August 21, 1877. The Ashbourne process for refining the oil included filtration, bleaching, high temperature heating and finally hydrogenation to ensure that no unsaturated fatty acids were left in the oil. Ashbourne began working on this process in 1875 and received patent number 194,287 on July 27, 1880. Thanks to Ashbourne’s early work, coconut oil is used in hair products, foods and scented products. Alexander P. Ashbourne did marry and have a family, but there is little specific information on his family life. Sometime after 1880 Ashbourne left Philadelphia and moved to Oakland, California to run a convenience store. He died in Oakland at the age of 95. Christopher McFadden, “The A-Z List of Black Inventors,” (Interestingengineering.com, July 13, 2018), https://interestingengineering.com/the-a-z-list-of-black-inventors; Donald and Jane Wilson, The Pride Of African American History (Birmingham, Michigan: DCW Publishing Co, 2003); Carroy U. Ferguson, Transitions of Consciousness from an African-American Perspective, (Dallas: University Press Of America, 2004).